COME, SEE & SHARE your ideas & needs!! Please join this new daytime group in the Fellowship Hall for quilt tying and sewing. If sewing, please bring your own machine. Please bring food to share. 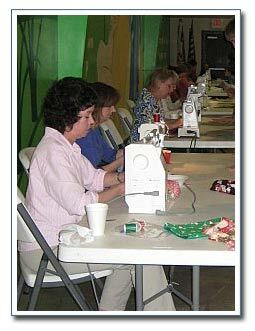 Please join us in the Fellowship Hall for quilting or work on your own personal projects. We will begin with a shared light potluck supper. 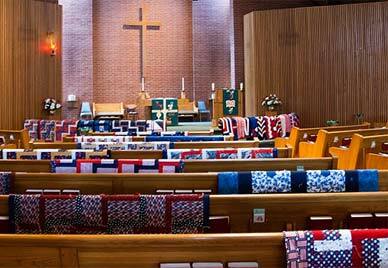 The LWR quilters will meet in the Fellowship Hall from 10:00 a.m. to 3:00 p.m., with a break for a potluck lunch. You do not need to be able to sew. All welcome. Bring a sack lunch or food to share, with beverages being provided. The Yarn Winders (Knitters & Crocheters) meet from 9:30 am. to Noon in the library. On Wednesday they meet in the Narthex from 6:00 p.m. to 7:30 p.m. Those who would like to learn how to knit and/or crochet are very welcome. Please contact Bonnie Dykhouse at 817-485-7508 if you have any questions. The Military Quilters meet in the Family Life Center from 10:00 a.m. to 3:00 p.m.
handmade teddy bear, 7 small stuffed animals, 7 large bags of current magazines. PNS: 10 pair of Ladies underwear, 10 bras, 5 Full size bottles of shampoo, 2 bottles of body lotion, 10 stuffed animals, 15 white folders. Greeting cards, used cell phones, school kit supplies, toiletries, magazines & paperback books, Xmas stockings, quilting sheets & fabric, underwear, t shirts, socks. Please see collection boxes in long hallway for details. In 2018, LWR distributed to 601,144 beneficiaries in 25 countries a total of 745,024 supplies. Please know that to this effort Texas contributed 19,556 quilts and over 25,000 kits (various). Thank you to all those who helped make the Bold Women’s Day celebration on 02/24th such a success. silence as a new-age practice and saw it as an unmediated experience with God, one that bypassed Scripture. I was amazed to hear of such a suspicion. “Be still and know that I am God” (Psalm 46) has shaped the Christian contemplative tradition for centuries. And in Lent, we are called to journeys of repentance, reflection and renewal in special ways. We are to follow Jesus into the wilderness of our souls—not as escapism or narcissism, but as a journey of listening to God in ever deeper ways. Action is certainly part of our Christian life, but frantic, harried days are not what God intended for us. We know that none of us alone can fix the accelerating momentum of our culture–in the same way that none of us alone can fix the materialism of our culture. Therefore, we have been exploring ways that our congregation (like all congregations are called to do) can act in solidarity around the Gospel, which offers values quite different than those of our culture. The wilderness, where we go not only in Lent, is filled with pressures that have made busyness one of the most often heard complaints in many lives. And in the face of this wild landscape, we are called as the church to create communities of alternative values, places where a subculture is offered, a place where Gospel values are taught, grappled with, and lived out, a Gospel life that we believe can only be lived in community. To act boldly in contemplation is indeed to act. It is to confess, to pray, to gather, to be alone, to listen, to strategize, to feel different in a culture of busyness. To act boldly in contemplation is a fruit of the Spirit, an act of faithfulness in this season of Lent and in every season. Where do you make space in your daily life for quiet? For contemplation? What might our lives look like if we made a point to affirm Sabbath and contemplation as countercultural spiritual practices? Loving God, you created us as human beings, not human do-ings. Let that be enough for us. Help us to embrace “being,” so that we can be here now.